The plight and the needs of homeless people in our community have been topics of considerable discussion during recent weeks. Frederick County Government has a long-standing history of providing housing assistance for the needy. The County currently delivers over $6 million a year in housing assistance. In addition to this, the County has recently joined with the City of Frederick to increase funding for the Cold Weather Shelter to make it a year-round shelter for needy individuals. The County is contributing $112,500 for this, while Frederick City is contributing another $37,500. Providing appropriate housing assistance is one of the most important benefits that can be provided for the poor. Providing basic food, housing and medical care for our children is a high priority for the County. The County’s FY2014 budget provided over $26 million in citizen services for those in need. This includes $6.2 million for housing grants; $8.8 million for the Health Department; $6.3 million for TransIT services; $2.2 million for seniors; $2.3 million for families and children; $1.4 million for employment services; plus over $200,000 to non-profits for pharmacy assistance, mental health assistance, housing and food for the needy. This is in addition to the meals that are provided for needy children through Frederick County Public Schools (FCPS). With this in mind, it must be acknowledged that the County does a lot to provide for the needs of poor children. We continue to be committed to provide assistance to poor students whenever new situations of need arise. During the recent ice and snow events volunteer fire companies and the Department of Aging Senior Center made their facilities available to provide warming centers and shelter for those without electricity as well as for homeless individuals. These services were in addition to the services provided by the Frederick Rescue Mission, Advocates for the Homeless, Religious Coalition, Frederick Community Action Agency (FCAA), and others. On January 17th, Frederick County convened a meeting of the Synergies Committee to discuss issues related to homelessness. Present at that meeting were representatives of the Board of County Commissioners, the Board of Education, the City of Frederick, the City of Brunswick, FCAA and some non-profit organizations. At that meeting, Pat Rosensteel, Director of Frederick County Citizens Services Division, was tasked to coordinate with FCPS, the municipalities and various service organizations in establishing an improved communication network to better enable the participating parties to provide housing for children whenever a homeless situation may develop. 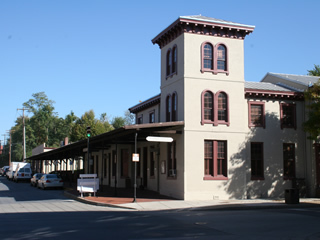 The next meeting of the Synergies Committee will be held at 1:30 p.m. on May 2, 2014 at Winchester Hall, 12 East Church Street, Frederick, MD 21701. The public is invited.